From October 27 to October 30, 2011, NAMTA held a fantastic conference on Psychogeometry, a newly translated and edited version of a work originally published in Spanish as Psicogeometría. An Italian version was edited by math professor Benedetto Scoppola and then translated into English. Kay Baker (an icon in the Montessori community who holds a doctorate in math education) edited the English version. She also worked with Benedetto Scoppola and graphic designer Miep van de Manakker to revise the illustrations and make sure they were properly integrated with the text. On Saturday, the editors talked about the book. Benedetto Scoppola's talk was mainly an overview of the book, but there was one nugget that's not in the book that I decided to record while it's still fresh in my mind. The subject was the "isoperimetrical problem". This issue came up in Benedetto's discussion of the figures on page 182 (a 4x8 rectangle) and 183 (a 6x6 square) of Psychogeometry. Two figures are isoperimetrical if they have the same perimeter. For example, a 4x8 rectangle and a 6x6 square both have a perimeter of 24. The "problem" is that these two figures don't have the same area. 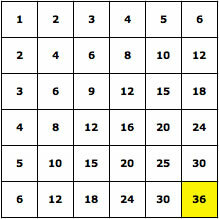 Benedetto noted that the difference between their areas is a perfect square (36 - 32 = 4). Benedetto pointed out a related pattern on the multiplication board. 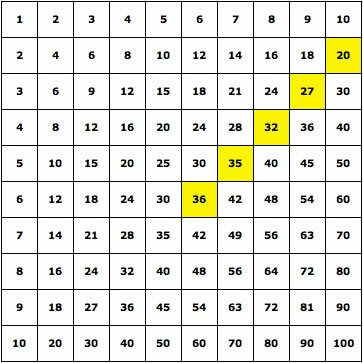 If you find 36 on the hundred board and then move diagonally up to the right, the next number you find is 35 (5x7), then 32 (4x8), then 27 (3x9), then 20 (2x10). These are all areas of rectangles that are isoperimetrical to the square of 6x6, and their areas all differ from 36 by a perfect square: 36-35=1, 36-32=4, 36-27=9,36-20=16. Benedetto didn't mention this explicitly, but you can see this activity as a beautiful way to reinforce the formula (a+b)(a-b) = a^2 - b^2 with examples like 8x4 = 6x6 - 4, which can be written as (6+2)(6-2) = 6^2 - 2^2. Students can start with any perfect square on the board to find relations like this. So pretty! For another activity relating area and counting to the multiplication table at the elementary level, see Counting and Multiplication (pdf or Microsoft Word).